Even getting it from the library like I did, I had the option of the smaller trade paperbacks, or the much larger Absolute Sandman. Deciding (accurately) that I probably wouldn’t be reading it super quickly (#GeekBaby), I got just the first volume, titled Preludes and Nocturnes. I don’t feel like I have a whole lot to say about it, especially as there is much more in-depth Sandman discussion elsewhere on the blog. So let me spend a moment to reflect on my experience as a first-time reader of this comic, rather than hashing out the comic itself. The trouble—and delight—of the Sandman comics is how many stories they hold. I don’t just mean that there are the original 75 comic issues and several spin-offs and additions to the series. I also mean that there are a lot of *stories* in there. There are many characters in the series, many plots running here and there, doubling back or halting at varying times. That may just be the nature of a series which has, for its main character, an embodiment of Dream. For what are dreams but stories? And Neil Gaiman is a master storyteller who was supported by a lot of masterful artists, producing texts that are dizzying and not unlike the TARDIS—bigger on the inside than the outside. With that caveat, here are 13 of my favorite Sandman stories. I’ve mostly chosen stand-alone story issues, and when I’ve chosen a large story arc I’ve chosen the volume rather than a single issue, so there’s somethings here that you can read even if you’ve Never Read Sandman (hint: Go read Sandman!). They’re more-or-less grouped by publication to make things easier. This is very early in the series, and it’s where everything began to fall into place, I think. We’re introduced to Death, here, and she’s somehow more cheerful than Dream. She’s beautiful, and she’s comforting–but she’s also a bit spooky. This one is just really quite fun. Murdery fun, in that same way that cats always seem to be a step away from killing you but are too cute to do it. It’s part of the collected volume Dream Country, the third collection in the series–a of stories totally independent of the series’ overall narrative. In the same volume is this gem. Shakespeare made a deal with Dream: in exchange for inspiration, Shakespeare would write two plays for him. The first of these is A Midsummer Night’s Dream, and in Gaiman’s tale we see Shakespeare put on the play for an audience that includes Titania, Oberon, and Puck—it is a gift from Dream to Titania. This story is another in a volume of single-issues stories, Fables and Reflections, the sixth collection in the Sandman series. In this story, Lady Johanna Constantine saves the head of Orpheus and ends the Reign of Terror during the French Revolution in the process. It’s a dark tale, but a very good one. This is the mostly true story of a fellow named Joshua Abraham Norton, the only Emperor of the United States. Gaiman based the issue partially on Norton’s life. The story showcases the rivalry between Desire and Dream and, in doing so, underscores the damage that Destruction’s departure caused. It is also collected in Fables and Reflections. This is a sort-of folktale, also collected in Fables and Reflections. An old man tells his granddaughter a story that happened many, many years before. The story concerns a young man who decided to find the beautiful daughter of a Duke after obtaining her portrait and what happens on the way. This is a fascinating one, full of subtle underpinnings in both language and art. This is a tale that made my heart ache, it’s so beautiful. We’re in Baghdad, and the city is a glittering wonderland. The Caliph offers the city to Dream in exchange for its preservation; and like all deals with Dream, like all magic, in fact, there is a cost. “Ramadan” is a fantastic ending for Fables and Reflections. This is the final of the tales told by travelers in World’s End, the 8th of the Sandman series. The collection is situated within a frame story–travelers have been driven into The World’s End: A Free House, one of the inns that provides shelter during reality storms. The story is told by Petrefax, who is from Litharge—a city of death that provides multi-cultural burial and death sacraments. His is a tale of tales—he relates three stories he heard during burial rites and rituals, and it works extremely well as a build-up to the final issues of Sandman. This is from an off-shoot of the original series, a book that Neil Gaiman and various artists collaborated on to write a story about each of the Endless. “The Heart of a Star” is Dream’s story; it is also one of the earliest stories in the Sandman universe. Dream is in love with a star, Killalla, who he brings with him to a meeting in the cosmos. The story takes place sometime just after the universe became habitable, and it allows us to see the beginning of Dream’s rivalry with Desire. This volume is actually an addition, published three years after the original Sandman run. It is the tale of a Japanese monk and a fox spirit, and it is breath-taking. This is the second volume in the series, and it’s where I think the story really begins to find its voice and presence. This collection is held together by Morpheus’s search for the dreams that left during his absence and his efforts to quell the dream vortex that threatens all of Dreaming. Barbie is a divorced woman with a crumbling fantasy world. In the wake of the dream vortex, the Cuckoo is now threatening Barbie’s dream life. The Cuckoo is a monstrous creature, and her antics threaten to spill into reality. And although most people seem to like this one the least, I love it perhaps the most of all the collections. This is one of my favorites of the collections. It features Delirium on the page more than any other story, and she’s a personal favorite. This is also where we first meet Destruction, the prodigal brother who left the Endless. Delirium enlists Dream to help her search for Destruction, and the quest is both surprising and enlightening. 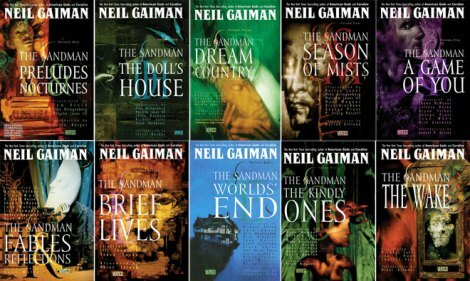 Here are my 13 favorite Sandman stories. I’ve also got a Thursday 13 coming on my favorite places from the series, and you can read my 13 favorite characters here. The numbers are original issue numbers, and they are ranked in order of publication. 1. “The Sound of Her Wings” – (8) Features the first appearance of Death in the series. A single-episode story that occurs as a sort of epilogue to Dream’s imprisonment, escape, and re-establishment of his realm. This is first story where we see the Endless interacting with one another as emotional beings. Dream and Death, feeding pigeons. Image via Comicvine.com. 2. “Collectors” – (14) Features the first appearance of The Corinthian. It’s an episode of The Doll’s House that occurs at a serial killer convention. It’s fabulous. 3. “A Midsummer Night’s Dream” – (19) The real story of Shakespeare’s A Midsummer Night’s Dream. Explains why that play and The Tempest are so different from the rest of Shakespeare’s work. Won the World Fantasy Award for short fiction in 1991 and touched off a controversy. There’s a possibly-apocryphal story that the room fell silent when the award was announced. Then Harlan Ellison laughed like a maniac. 4. Season of Mists – (21 to 28) Lucifer empties Hell, abdicates his throne, and gives Dream the key to dispose of as he will. Asgard, envoys from the ancient Japanese and Egyptian pantheons, emissaries from the courts of Faerie, Order, and Chaos, and a host of others show up on Dream’s doorstep. Diplomatic hi-jinks ensue. 5. “Thermidor” – (29) Dream sends Lady Johanna Constantine to revolutionary Paris on a secret mission which I can’t explain, because spoilers. She interacts with many historical figures, including Thomas Paine, and accomplishes her mission. She is also instrumental in ending the careers of Robespierre and Saint-Just. 6. “Three Septembers and a January” — (31) Explains how the career of His Majesty Joshua Abraham Norton, the one and only Emporer of the United States, came about. 7. Brief Lives – (41-49) Delirium decides to go looking for her brother Destruction, most-loved of all the Endless, who abdicated his realm sometime in the late 16th or early 17th Century and declared he was no longer a member of the family. After Desire and Despair refuse to help her, she visits Dream. He’s at a moment in his life where he needs a diversion. He accompanies Delirium, and gets more than he bargained for. 8. “A Tale of Two Cities” — (51) A Lovecraftian story from World’s End in which a man wanders out of a real city and into the dream of a city. He eventually finds his way back to the waking world, but is done with cities forever when he returns and ends up retiring to the outskirts of a small hamlet off the coast of Scotland. Because if you can wander into the dream of a city, that means the cities are sleeping. And where will we be if the cities ever wake? 9. “Cluracan’s Tale” — (52) Also a stand-alone story from World’s End, as are the next two. Cluracan is a hard-drinking, omnisexual courtier of the Faerie Queen. She sends him hither-and-yon across the planes as her diplomatic envoy. The Internet will tell you that the word “Cluracan” is associated with “Leprechaun.” This is a simple tale of adventure and prophecy that shows you exactly what happens to corrupt officials who mistreat envoys of the Seelie Court. 10. “The Golden Boy” — (54) Tale set in an alternate United States in which first generation youth voters change the constitution to allow the election of a young president. They elect Prez Rickard, and he becomes a Messiah figure with a tiny bit of help from Dream and Death. 11. “Cerements” — (55) A story set in The Necropolis Litharge which explains how Litharge functions. Also, it’s quite a spooky tale, and Litharge is important to the plot. 12. The Kindly Ones — (57-69) Dream .v The Furies. That’s really all can say about it without going massive on the spoilers. Possibly a subversion of tragedy. If so, Gaiman is making a point about justice. Or maybe about Justice. 13. “Exiles” — (74) The penultimate issue of the original run. Occurs in the Soft Places. It involves an exiled Chinese civil servant, a kitten, Dream, and a centuries-lost Roman cavalry unit.